The Tales of Beedle the Bard appeared in our household around Christmastime. Being that it is a quick and easy read, I got right to it. The Tales of Beedle the Bard are referenced in Harry Potter and the Deathly Hallows. They are a collection of fairy tale like stories for wizards. Hermoine receives the book in hopes that she will use it to problem solve in the concluding adventure of the series. (I'm trying not to provide any spoilers in this description in case people haven't read about Harry Potter yet.) Rowling wrote The Tales of Beedle the Bard at the conclusion of the series in manuscript form. The book was printed in limited quantity with proceeds earmarked for charity. All proceeds were (are?) to be donated to the Children's High Level Group (now called Lumos). The book sold well to Potter fans and quite a bit of money was then donated to this fund. This is definitely a book that you will want to read after reading the Harry Potter series, if you care to read it at all. (It's not necessary.) I would say that this book would be well-received by fans who just cannot get enough of Potter and will take any bone that Rowling will throw to them. Now, I've been honest in describing my Harry Potter journey. I started out an extreme skeptic and turned into a rabid fan. However, I don't find myself wanting more Potter for the sake of more Potter. I thought the original series was brilliantly written and concluded very nicely. I've not been tempted to look at the Pottermore website or wish for trips to Universal Studios to "experience the world of Harry Potter" or anything like that. A good series solidly written and concluded is immensely satisfying to me and I don't want to risk marring it with "add-ons" meant only to satisfy cravings. 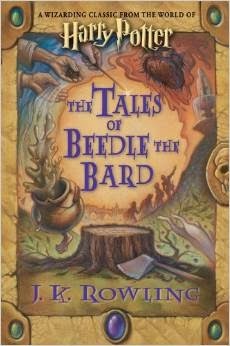 In The Tales of Beedle the Bard we have five wizard fairy tales which are similar to those of muggles in that they have a moral. However, not all of these stories have a happy ending. (One of the stories is downright gruesome.) There is commentary from Albus Dumbledore explaining the history of each story and the point of its inclusion in the text. So Rowling is a clever in giving us a taste of Dumbledore and a few additional tales to think about but I find myself wishing to refrain so as not to accidentally take away my enjoyment of her meaty, delicious Harry Potter series. I've heard from others that this is a "take it or leave it" book and I concur. It's not horrible but it also does not work in satisfying the itch for Potter for me. One day, likely not too far from now, I'll re-engage with the series as a whole and will enjoy it all over again. (Never the same way as the first time, I imagine, but still . . . ! I will enjoy it!) I guess I would categorize this book is a "nice thought" but left me feeling "blah" at the conclusion. Nothing but straight up Harry for me, thanks!